There are certain functions that qualify as being uniquely American activities – the proverbial slice of Americana. Certainly community BBQ’s deserve to be in that category. Usually small town affairs, they are often held at the firehouse or the town park, or in our case in Schroon Lake – on the grounds of the Fish and Game Club. The club serves as the community’s civic center. It has a dining room that holds a few hundred people. Outdoor pavilions built specifically to hold this annual event, shelter picnic tables that accommodate a few hundred more. With the singular exception of one school reunion, in twenty years, I have never seen them used for any other public function. There’s a baseball field and horseshoe pits and the requisite bar, back behind the dining room. Volunteers keep the place ship shape and ready for the next function. Dozens of volunteers will make the place ready for next Saturday, when hundreds of locals gather for our annual farewell to summer. Traditionally held the weekend after Labor Day, it is one final opportunity to spend time with your neighbors, most of whom will soon be closing up their summer camps and departing for warmer climes. Within a month the town population will drop from over five thousand summer residents, back to the seventeen hundred who call Schroon Lake home. The Lobster Crew getting ready to boil water. For $30 you get a whole Maine lobster dinner complete with boiled potato and corn on the cob, unlimited clam chowder for as long at it lasts, our world famous BBQ’d chicken with all of the fixin’s (well maybe not world famous ~ but pretty popular in Schroon Lake, NY). There’s also a beer cart selling brews, and hot dogs and sausage and peppers for those who need even more to eat. There is a friendly rivalry between the crew that cooks the lobsters (Dozer Dan & Co.) and the Chicken Crew, comprised of yours truly, my Wednesday night table mates – Bob, George, Dennis and Doc, and a few other friends. The rivalry centers around my contention that the chicken should get top billing – as in Chicken and Lobster Bake, not Lobster and Chicken Bake. For years the affair was billed as the “Lobster Bake”. When we took over the chicken grills five years ago, we insisted that the chickens get recognition. 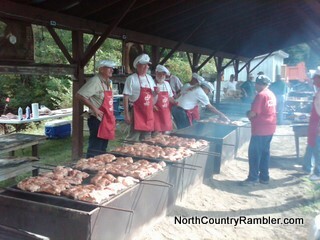 The Schroon Lake Fish and Game Club marketing committee saw fit to re-title the event as the Lobster and Chicken Bake. Last year I wrote a letter to the Times of Ti editor (the local paper) explaining my position, which they printed under the heading – Chickens Cry Fowl! My premise is this – the chicken crew spends weeks preparing for this event. We blend out secret spice rub for the birds (See recipe here.) We simmer our homemade BBQ sauce for hours the day before the event. We prepare the grill pits – so called firehouse grills – that can barbecue 480 half chickens at one time. Then we have to slave over smoky BBQ pits for hours to make it all come together – exactly on time. The lobster guys on the other hand, show up an hour before, boil some water, plunk in a few hundred lobsters and wait until they turn red. For this they should get top billing? I don’t think so! You should stop by and see for yourself. Have some of our chicken. Maybe try a lobster. (It’s included in the $30 chicken price) Listen to some music (and dance in the parking lot if you like). And please stop over and say Hi. We hope to see you there. Alert, alert! The “CHICKEN” and lobster bake is coming up quickly. Saturday, September 12th. If you want a taste of what real people do in America, be there.